cubatravel has been a member since February 27th 2014, and has created 25 posts from scratch. Welcome to the official guide for Cayo Santa Maria, it is designed to give you a quick overview of the island, some things to do in Cayo Santa Maria, all the hotels on the island and a list of major excursions available. Our guide also caters for those on a limited budget who may wish to stay in cheaper accommodations in Caibarien and visit Cayo Santa Maria simply for a day out, skipping the all-inclusive hotels but, visiting Cayo Santa Maria anyway. As its only 48km from the mainland, this is easily done and the beaches in Cayo Santa Maria are the same for everyone. A brief overview of Cayo Santa Maria hotels is also provided, however by visiting the “Reserve” section there are visitor reviews and more concise details of each hotel, including rate comparisons and multicurrency price checks, ensuring the very best rates direct from the source. You don’t need to book at the “Reserve” section but you will certainly find the more precise information for each hotel useful. Cayo Santa Maria is linked to the mainland near the city of Caibarien via a 48 km causeway constructed between 1989 and 1999. There’s a 2 CUC per vehicle toll fee, introduced to attempt to finance the road itself. The first hotel on Cayo Santa Maria was the Sol Cayo Santa Maria, operated by the Melia Group since December 2001. All the hotels in Cayo Santa Maria are owned by the Cuban Hotel Group Gaviota and managed by the respective hotel chains shown below. There are currently 10 hotels for a total of 6,785 rooms in Cayo Santa Maria (2014). A limit has been set for 10,000 rooms on Cayo Santa Maria, therefore approximately another 5 hotels will be built then development ceased. The idea is to maintain eco harmony and exclusivity for the island and avoid overdevelopment. 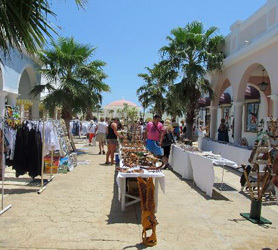 What is the main attraction of Cayo Santa Maria? The primary attraction of Cayo Santa Maria is of course the predictable weather and its 8 miles of virgin beaches. Cayo Santa Maria was designated a UNESCO biosphere reserve due to the region’s exuberant flora, made up of 248 species, including 91 medicinal, 72 timber, 41 resin-producing and 40 ornamental wood species, along with vestiges of pre-Columbian cultures found in caverns near the beach, and beautiful underwater seascapes. If you’re not yet convinced, Cayo Santa Maria is a truly stunning location for a vacation. Flamingos, endemic lizards grace the pristine beaches and coves, along with mollusks and, favorite amongst birdwatchers, the island’s national bird – the Tocoroco – chosen because its plumage displays the exact colors of the Cuban flag. Cayo Santa Maria’s beach itself is one of the most tranquil in Cuba, stretching for 13 kilometers with its extremely fine “true white” sands, with calm crystal clear turquoise waters. The coral barrier reef, the world’s second largest after Australia’s Great Barrier Reef, protects the beach from winds, meaning waves are never overwhelming, thus permitting a wide selection of marine life to make this Cuban beach paradise their home. If you’d like to see some of the Authentic Cuba, you can still do this by visiting Caibarien, a small city just 48 KM from the island and an ideal day out to mingle with locals, visit a Paladar or hang out on its trendy Malecon boardwalk boulevard area. What type of Holiday can I Expect in Cayo Santa Maria? 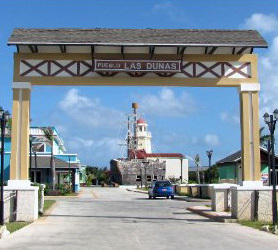 Cayo Santa Maria’s main asset is its uniqueness. It’s a small island with little in the way of shopping and commerce. Besides the two so called shopping and entertainment “Pueblos” of Pueblo Las Dunas and Pueblo La Estrella, there is little else to separate you from your money. All the hotels are All-Inclusive; therefore, unless you really go crazy on tipping, spending more than the cost of a few Excursions in Cayo Santa Maria is going to be quite a task. Ideally, you will come to Cayo Santa Maria to relax on the beach, snorkeling, swimming and diving. Hang around on your resort or utilize the often free “Resort Passes” to discover an adjacent Beach resort managed by the same hotel chain you are staying at. Melia are famous for this but, Memories and Iberostar have now followed suit with their own all-inclusive day passes. As a place to unwind, laze around and just take in the natural scenery, Cayo Santa Maria is pretty hard to beat. Alternatively, if you’re looking for intense nightlife, tons of activities and attractions, with little downtime between each, you would be better off visiting Varadero or better, Havana. Which other Islands in Cuba offer a similar experience? To the east of Cayo Santa Maria there’s Cayo Coco, which is more developed but, also more commercialized. Then there’s Cayo Guillermo next to Cayo Coco, which was the first island in the Jardines del Rey Archipelago to be developed but, its much like Cayo Santa Maria. The Spa is gorgeous and allows you to use all the amenities if you book a spa time. The pool is surrounded by comfortable nice padded lounge chairs. The spa features sauna, hot tub, cool tub, steam room, showers and massage center. The massage therapists are professional and do a fantastic job; as do the staff who give manicures and pedicures. Prices are reasonable ranging from 15 to 60 CUC. There’s so much more to do at Pueblo La Estrella, it’s a big place, so we’ll let you discover the rest! 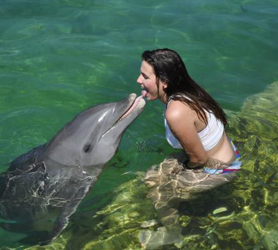 The Dolphinarium is located in Cayo Ensenachos which is about 30 km away from Cayo Santa Maria. The drive will help you to get to know the other island where multiple hotels are located. The Dolphin Show is a real treat for the whole family with over 20 dolphins doing stunning tricks along with sea lions competing for your attention. The Dolphin entertainment area is quite large at 900 m2 and offers 260 seats from which to watch the shows. The Dolphinarium also has a small store for souvenirs and refreshments plus a tiny café-bar. Depending in whether your tour includes it or not there’s a great restaurant that serves a delicious meal of chicken, lobster and shrimp which is not to be missed. There are two different tours, one if the daytime tour then there is a second nighttime tour which includes drinks and a type of disco at the ends. If you can make it out to the Dolphinarium alone then the cost is only 5CUC compared to some tours that are upwards of 25 CUC, including a combined Catamaran Cruise Tour along with the Acuario Dolphin Tour. The aforementioned meal by itself is 12 CUC. The dolphin show is truly fantastic; particularly one dolphin which appears to be the most well trained one which does multiple spins (maybe about 5?) before hitting the water again. Kids can go down to the poolside and touch the dolphins and there is a session at the end of the Dolphin show when you can get in and swim with them for an extra 60 CUC. If you don’t decide to visit the city of Caibarien for a whole day the Cayo Santa Maria Jeep Safari will take you to the city anyway, as it is the place where the Suzuki Jeeps are collected from to take this impressive tour Jeep Safari with a hint of ecotourism thrown in! Remember to bring your license if you want to drive one of the jeeps… These are small jeeps, called Suzuki Jimny, designed for 4 people. If you’re a family of 4 then you can all take the trip in one vehicle, otherwise you can join others in separate vehicles. The tour begins with a drive on paved road between immense Cuban royal palm trees, through sugar and coffee plantations to a chicken breeding farm where a make-up rooster fight (no killing) takes place. The farm offers an impressive array of animals, from: flamingos to crocs, iguanas, ducks, and peacocks, a real treat for kids. Another area of the farm lets you see pigs and even milk a cow! The Jeep Safari excursion then recommences, including driving on a dirt road for about an 1 hour, this can be quite dusty for those on vehicles behind the lead car! A stop for lunch is at the Rancho Querete, another real farm where lunch is served in traditional Cuban style with succulent pork, sweet potatoes, cucumber, rice with black beans, fruit and coffee. We then drive onto the Cueva de Valdes where you will have the chance to swim in a river under a picturesque waterfall. Horseback riding is also included, the trip starts from the waterfall and takes about 10 minutes but is quite fun and you can let the kids go it alone if you want as they’re pretty much in eyesight. You will take the paved road back to return the jeep. The whole trip takes in some beautiful and breathtaking landscapes. The scenery is idyllic and gives you a true feel for Cuba after being on Cayo Santa Maria. 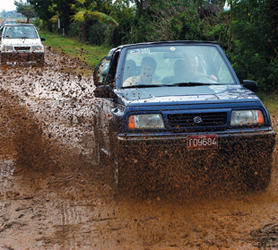 This Cayo Santa Maria Jeep Safari excursion starts at 8:30 am till 6 pm. Prices are 75 cuc per adult and 53 cuc for children and it’s well worth the cost.